VeriCite DocumentationUser GuidesVeriCite Help VeriCite LTI Instructor HelpHow do I search VeriCite LTI student submissions? If you have a large class, it can often be helpful to search the assignment submissions to locate a particular student or paper. From the Assignment Submissions page, type your search term into the Find text box. 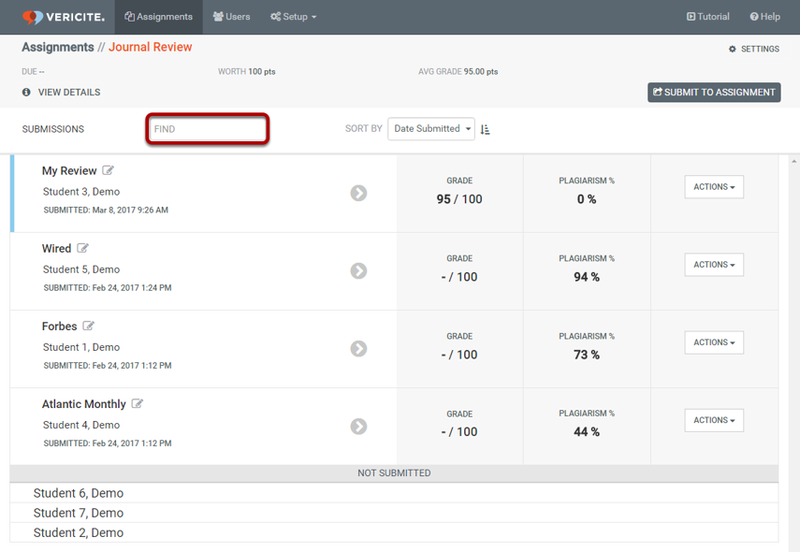 Zoom: From the Assignment Submissions page, type your search term into the Find text box. You can type in any part of the student's name or submission title to locate the submission. The search is dynamic, so the results will update as you type. Results matching your search will be displayed. Zoom: Results matching your search will be displayed. If there are no items containing your search term, you will see only the Not Submitted student list. Zoom: If there are no items containing your search term, you will see only the Not Submitted student list. Click the X icon to clear the search filter and return to the full list of submissions. Zoom: Click the X icon to clear the search filter and return to the full list of submissions. Prev: How do I sort VeriCite LTI student submissions? Next: How do I search for VeriCite assignments in the assignment list?